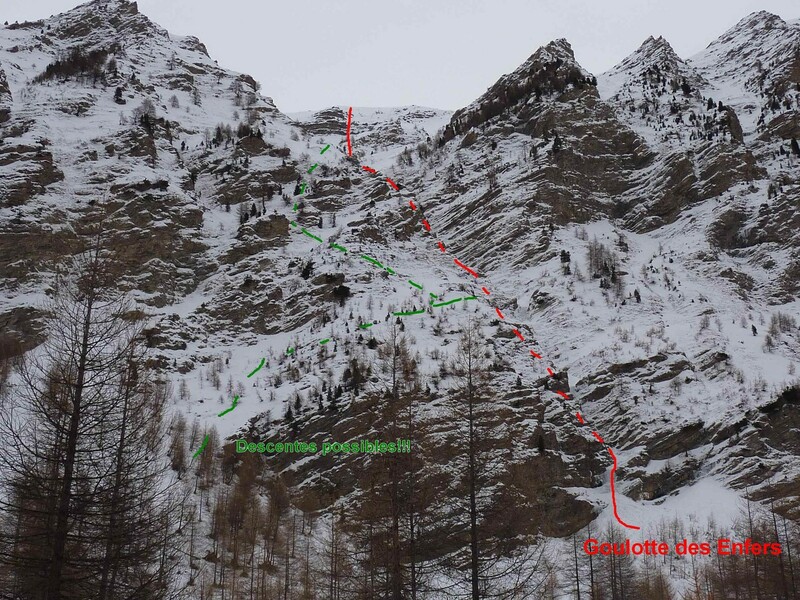 Four climbers have been killed this afternoon by an avalanche in the Goulotte des enfers (Hell’s Gorge)which leads to the 2604 meter Barre des enfers. The group were accompanied by a High Mountain Guide who was injured by the slide injured. The 700 meter climb is graded as Very Difficult. The first known ascent of the route was by Sébastien Constant, a high mountain guide. In his description of the 2007 ascent he noted that the route is very exposed to avalanches and is only to be attempted under very stable conditions. The couloir funnels purges from the upper slopes and is dangerous during fresh snowfall. The avalanche risk was 2 at the time of the incident and the underlying snowpack was stable. Due to the poor weather (high winds) the PGHM rescue helicopter had to land at Crévoux and the rescue teams then proceeded on foot. A father and son suffered mild injuries after an avalanche yesterday afternoon while skiing off piste in Valloire in the Maurienne. Around 16h they triggered a windslab in the Combes des Granges sector. The wind had been blowing in 100km/h gusts since Monday. Not deep the slide was 30 meters wide and carried them 300 meters over two rock bands of 4 meters each. The father, only partially buried, was able to dig himself out but suffering from a fractured tibia and fibula he was unable to help his 12 year old son who only had his helmet clear of the snow. The boy was rescued by piste patrollers suffering from mild hypothermia. The snowpack was unstable in the sector and there was a concern of secondary avalanches. The rescue services had a tough day yesterday with other injuries on piste. The TF1 news reported that all the climbers were equipped with avalanche transceivers. They were carried several hundred meters by the slide. Obviously you don’t need a lot of snow to knock you off a steep, icy face like this. The climbers were Bretons from the Rennes CAF. The guide Charly Demor, himself from the Rennes area, studied with two of the deceased at the INSA in Rennes before becoming a High Mountain Guide specialized in climbing. In 2000 he climbed the North Ridge of Mont Shiliving in the Himalayas as part of an elite CAF group.